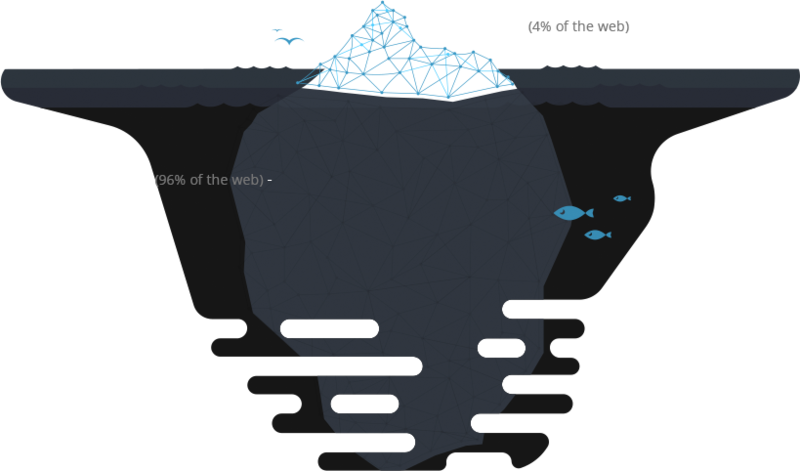 The Deep Web is the part of the World Wide Web that is not discoverable by means of standard search engines, including password-protected or dynamic pages and encrypted networks. Traditional search engines such as Google, Yahoo or Bing cannot index these databases and thus cannot include them in their search results. To better understand what the “Deep Web” is, one must have a basic understanding of how search results work. There are 60 trillion individual web pages currently, a number that continues to grow by the day. The search engines mentioned above navigate the web by “crawling” or following links from page to page. They then sort these pages by their content and other factors such as the string theory, p-brane, and physics. This information is then stored and kept track of in an index. Every item you search for on the web is being categorized and stored. All information stored in these indexes is then passed through a complex set of algorithms, programs and formulas to deliver the “best” possible results for the user. These algorithms use “clues” (search methods, query understanding and synonyms) to ascertain what the user is intending to mean. Those results are then ranked and an end product is produced for the search in as little as 1/8th of a second. This complex system has been conscientiously crafted to create an improved user experience. As you navigate away from these search engines and their search boxes you will undoubtedly find out that you may not be able to extract exactly what you are looking for. Take travel sites (Expedia, for example), government databases or libraries, for example. These sites do not contain search boxes but instead use links to help the user navigate throughout the website. If you are searching for a particular hotel in a certain city, you must navigate through the sites links to find your final destination. This is a perfect example of what the Deep Web is; anything that a search engine cannot access. The Deep Web incorporates the Dark Web but the Dark Web is further classified as “a small portion of the Deep Web that has been intentionally hidden and is inaccessible through standard web browsers”. The Dark Web can be accessed by any user utilizing the Tor Network who wishes to keep his online activities as anonymous as possible. How do I Access the Deep/Dark Web? It’s actually not that difficult. The Dark Web uses the domain suffix .onion designating that the particular site you are visiting is an anonymous service only reached via the Tor network. Since you cannot simply access the Dark Web and the Tor Network from a normal web browser, the first step you must take is to buy an Anonabox or download the Tor Browser Bundle from torproject.org. This will ensure that all of your web traffic is run through the Tor network and is the first step to anonymous Deep Web Access. Anonabox Routers offer the Tor Network and the advantage of requiring no downloads or software configuration in a small and portable device. To learn more about Anonabox Tor routers and which model is best for you, click here. Once you decide what option is best for you, begin by visiting the Tor Search engine. From there you can navigate and find what you are looking for. Did you know Facebook allows you to access their site utilizing Tor? All you have to do is use their new .onion url. It’s really that simple! Here is a site with a list of .onion website addresses. Why Should I Use Tor and the Deep/Dark Web? Although there are many negative connotations deliberately connected to the Dark Web (the Silk Road as one example), it also may stand as the last prospect for freedom of speech, privacy and online anonymity. The government and media wish to elicit fear and intimidation by associating Dark Web users as felonious and law breaking. According to a January 2015 survey, illegal activities on the hidden services Dark Web constitute roughly 35% of the search content. What these outlets are not articulating to you is that the Dark Web is also allowing people operating within closed societies to communicate without obstruction and intrusion. Even in so-called “free societies”, such as the United States, Europe and Australia, we are consistently having our right of privacy and liberty compromised and trampled upon. It is time to take a stand against these massive government intrusions and monitoring of law-abiding citizens. Support online anonymity and our right to access both the Deep and Dark Web by utilizing the tool that is available to you: Anonabox. Protect Your Privacy Online Today with Plug & Play simplicity!